Wakanda’s client connector Angular-Wakanda provides a full integration of backend project to frontend. 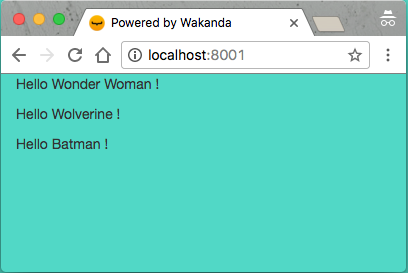 Let’s see how you can display the superheroes you generated in the built-in database to your web frontend. Its controllers are in the folder web/app/controllers. Open its existing controller file web/app/controllers/home.js. That’s where we’re going to access the datastore. Here $query() is an Angular-Wakanda method for querying all the Superhero entities saved in the datastore. Here I used it to retrieve only the last 3 superheroes created through a promise.